When a noteworthy genre movie slips under my nose, I tend to be surprised and a little let down that such a thing happened. Case in point: 2010's The Dead Matter. The directorial debut of Edward Douglas (main guy behind Midnight Syndicate), this sucker is the kind of movie that gives certain Indie Horror a good name, as it has plenty of humor, Gothic ambiance, and engaging plot points to make it worth seeing. Plus, it's from my home state Ohio! Our tale deals with an ancient relic that can give you the power to raise and control the dead. Teenage witch Gretchen (Sean Serino) is mourning the loss of her brother, and lo and behold, she finds this relic, meaning she can now raise the dead and possibly bring her brother back. However, everything’s not exactly going to come up Milhouse for Gretchen, because there are people after the relic. People like McCallister (Jason Carter of Babylon 5 fame), a vampire hunter who wants it destroyed once and for all. Oh, did I say vampire hunter? Yeah, some bloodsuckers want possession of the thing. There's Sebed (Tom Savini), a leader type who runs a sort of vampire-style drug ring and seems to control some with some sort of super coke. Then there's Vellich (Andrew Divoff), who wants it for more nefarious reasons, and also serves as Sebed's rival. Oh, and then there's the fact that possessing something that can bring the dead back to life might not be the brightest idea. That's because Gretchen's circle of friends get embroiled in the battle between Vellich and MaCallister (no, his first name isn't Kevin), as well as Vellich's evil schemes. That and the whole thing about how ancient relics can turn on their owners. Can't forget that little tidbit. 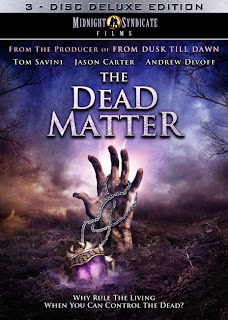 I don't know if I could call The Dead Matter an instant classic, but it is the kind of movie that makes digging around for certain titles a good time. The cinematography is fantastic, with plenty of lush detail to scenery and imagery. The score is also worth mentioning, though those that know about Midnight Syndicate should expect quality. It has all the markings of a classic horror score and perfectly fits the surroundings. The performances from Savini, Divoff and Carter are all notable. Savini plays his performance with a certain level of cool, while Carter is clearly having a good time playing MaCallister. It's Divoff who steals the show. 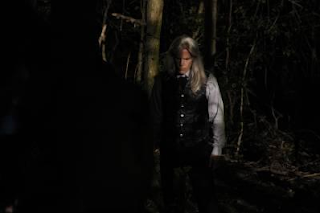 He plays Vellich perfectly, lovingly straddling the line between camp and menace, and making him a compelling villain as well. Plus, he has the best ridiculous Fright Wig in like forever. Best of all though, is that it captures its tone perfectly. It would have been easy to play the whole thing as a joke, or to turn it into an over-the-top splatter film, but it never gives into those temptations. Though it's clear that those involved aren't taking this too seriously, you never see anyone dipping into camp histrionics. Plus, there's some gore, but it never goes too far with it. I find that this fits the movie perfectly. Going too far would have ruined the movie, as it manages to be funny (beer drinking zombie!) and eerie (the dead here look like a mix of the zombies from The Living Dead at Manchester Morgue, one of the Deadites from Evil Dead II or Army of Darkness, and the more spectre-like dead of Carnival of Souls) effortlessly. Mix '80s genre movies like Night of the Creeps, '60s-'70s Gothic horror like Horror Hotel, and add a pinch of The Craft and Children Shouldn't Play With Dead Things, and The Dead Matter is the end result. If you enjoy your Gothic horror with a bit of a playful side, then check this out. Thanks for posting my review.